Flu. I feel so vulnerable during and just after illness, as though my will has failed in a small way, just to show me nothing is in my control. Catastrophic thinking? Maybe. Nonetheless I’ll take care of myself today, and tomorrow again pick up with resolutions and determinations. For today it is enough to write this note, even if a few days late, keeping with “posting once a week.” A small gesture. Although it took pausing a few times, George the dachshund and I did get to watch the “Kalachakra, L’éveil” film available through Amazon Prime. It didn’t go quite as deeply into teachings as I’d hoped for, yet I learned so much and felt the embers of devotion stirring. George loved the chanting during the film, perking his head up to look at the television each time it would begin. It felt good to let my senses be flooded with auspicious symbols and reminders of the timelessness all time is embedded in, especially when feeling so discouraged and weary. One’s body feels like a thin place itself in such moments, like the mandala above can be a thin place. 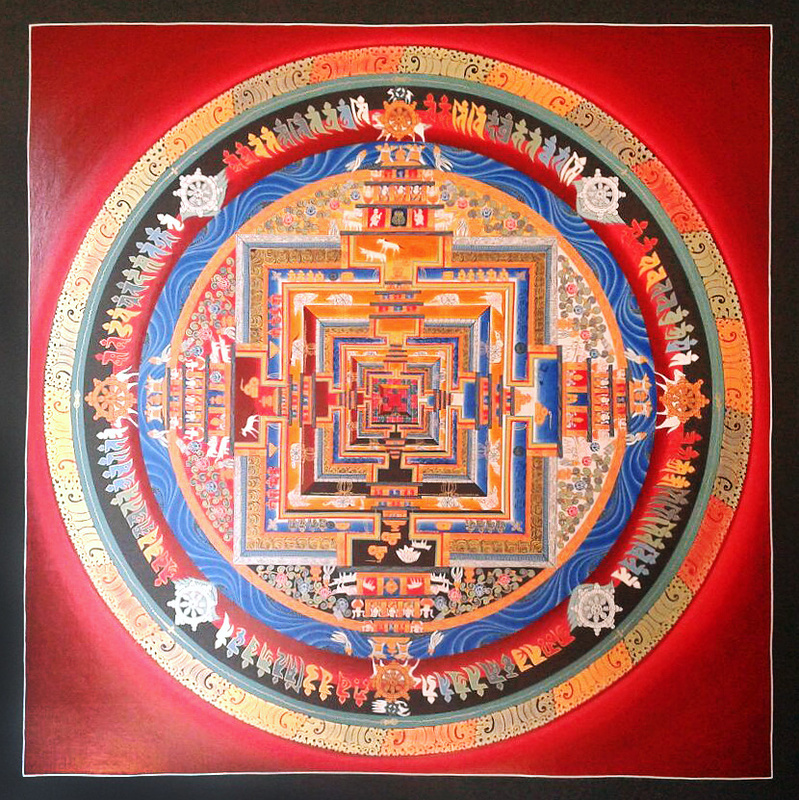 In the film they showed that to learn to read this mandala, the beginning order is from outside in, at the gates beginning with body, then speech, then mind (very center). Within mind, there is then the pavilion of wisdom, and the pinnacle of bliss. Of course, the longer you linger, the image seems to lose the sense of outside and inside entirely. Gorgeous how much can be imparted in one image! I remember that when I first began studying Buddhism, Tibetan imagery felt like overkill to me, just ‘too much’, but that feeling subsided once I began to understand what the symbols were meant to point to and the relationships between them. Memory seems to keep these maps very well. Thanks, yes I am. 🙂 Hope it has gotten much warmer for you there (as it is here today), so you can step into those deep blue waters!